A double-braced double tom stand for drummers to solidify and optimize their setup. If drum mounting hardware should hold up drums and enable you to position them with precision, the DW 9000 Series Air Lift Double Tom Stand is your match. Made from heavy gauge tubing with oversized tube joints to minimize wobble, and armed with a ball-and-socket adjustment for easy positioning. 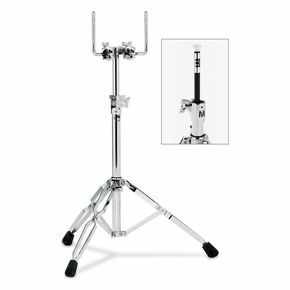 Stands include 1/2 diameter tom arms to work with DW TB12 brackets and auxiliary clamp for mounting cymbals or other percussion accessories. Pick these up today to simplify and reinforce your kit setup.